After a fortnight in Yalta, Dmitri Dmitritch Gurov has grown tired of the seaside. He is looking for a more interesting way to pass his vacation when a woman with a Pomeranian catches his eye. 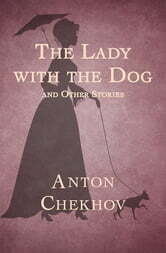 Gurov loathes his wife, and has spent his marriage chasing women, even though the affairs always end in disappointment. But Anna Sergeyevna will be different. For the first time in his life, Gurov will know love—and he will find it a very harsh mistress. Widely recognized as one of literature’s sharpest observers of human nature, Anton Chekhov has influenced generations of writers. Including such heartbreaking gems as “A Doctor’s Visit,” “The Head of the Family,” and “The Black Monk,” this sparkling collection showcases a brilliant craftsman at the top of his form.